The last issue of the research-and-art based journal DYSFUNCTION (dir. Natalia Bobadilla, Antoine Lefebvre Editions, Philippe Mairesse) is dedicated to the Trial of Fiction organized by a people is missing during the Nuit Blanche in October 2017. With texts by Francoise Lavocat, Alexandre Gefen, Laurent de Sutter, Nancy Murzilli, Mathieu Simonet, Camille de Toledo, Alison James, Sinziana Ravini, Jean-Charles Massera, Frank Smith, Judith Michalet, DYSFUNCTION Team, Aliocha Imhoff & Kantuta Quirós, and illustrations by Pauline Fargue et Marion Bertrand. …created Natalia Bobadilla, Antoine Lefebvre and Philippe Mairesse in the research program ABRIR funded by the National Research Agency. ABRIR was a four year collaboration (2013-2017) between the artists researchers of the ART&FLUX team and the management researchers of the DRM MOST. DYSFUNCTION is hybrid, it is both an artist publication and research object. Each issue focuses on a project that mixes art and research in social and human science, and disseminate research results in an artistic form. 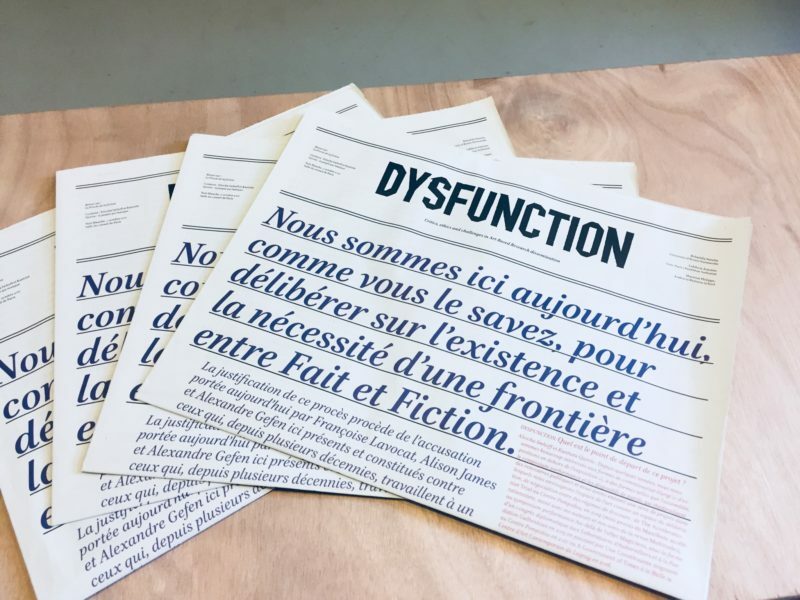 DYSFUNCTION is published in an edition of 1000 copies under Creative Commons BY-NC-SA. It is available for free at 本 \hon\ books until supplies last.